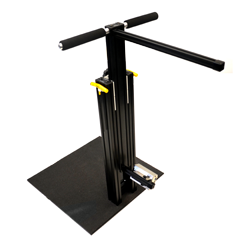 The Hand-Held Dynamometer Support Stand allows you to fixture the dynamometer to objectively measure the isometric force exerted by the patient. Stabilizing the dynamometer improves the intratester and intertester reliability and also has been shown to produce greater maximum effort from the patient. The stand can be configured to test numerous upper and lower body muscle groups. A foot plate is included for the examiner to stand on and adjustable handle bars provide additional stability. The stand can also be easily collapsed and transported.